Pune-based K Joshi and Company has signed a deal to buy a Bobst Visionfold 110 folder-gluer. The deal was announced by the two parties on the third day of Printpack 2019. This will be the first Bobst folder gluer at K Joshi and Company. K Joshi and Company is into commercial printing as well as into printing packaging cartons. This move to buy a brand new Visionfold 110 folder-gluer will enable the company to take up high quality packaging carton jobs, says Anil Joshi of K Joshi and Company. “We were looking for a company which can offer high level of reliability and lasting peace of mind when it comes to after-sales service. 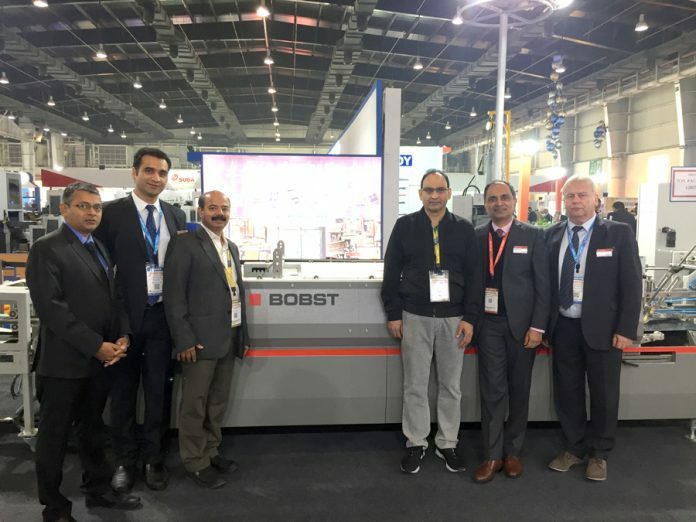 Buying a Bobst machine involves big investment but we decided to go ahead with that decision,” Joshi says. K Joshi and Company is looking to further expand into the carton packaging segment but wants to focus on only premium jobs. “Right from the onset, we decided that we will not chase volumes and focus on high value customers and niche jobs,” he adds. The new Bobst Visionfold 110 folder-gluer is expected to be commissioned by end-March.